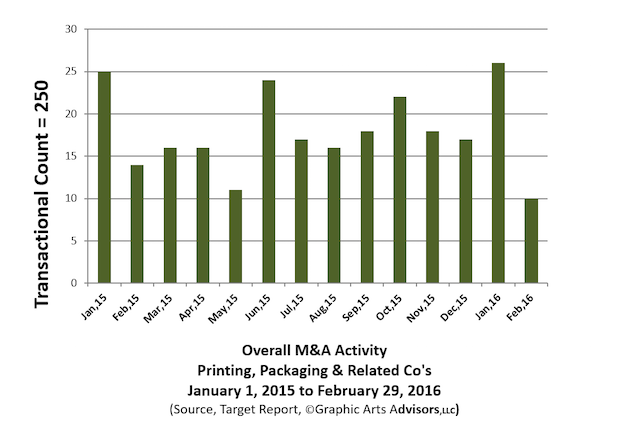 Is the market cooling off for companies in the printing, packaging and related industries? After the peak number of deals announced in January, there was a sudden and noticeable drop off in transactions. No mega-deals were announced in February, and with the exception of two deals by Luxembourg-based powerhouse ink supplier Flint Group, no big players were active. Accentuating the decline in M&A transactions there was a slight uptick in industry-related bankruptcy filings, accompanied by the steady drumbeat of non-bankruptcy plant closures. While it does not appear that we should be battening down the hatches, we may be seeing at minimum a pause in industry transactional activity as buyers take a break while multiples cool off a bit. Several private equity fund principals we spoke to have noted that they are taking a bit of a breather and stepping back from the packaging market despite their genuine interest in the segment. They report that sellers have caught “multiple fever” and continue to ask for higher and higher valuations, feeding on the prices they have heard that others obtained, and wanting even more. In a discussion about the broader transactional market at a recent panel discussion consisting of family office investors and their professional managers, there was a general consensus that they have become very selective about new investments. Given the patient nature of their funds, they are sitting it out while multiples cool, rather than chase ever more expensive deals. CCL Industries recently announced transactions that illustrate that prices for packaging-related companies may in fact be moderating. Three deals announced in January had an average enterprise value to EBITDA ratio of just 5.1, in contrast to the oft-reported multiple range of 6 times to 8 times EBITDA. CCL acquired Woelco, a German label printer that specializes in OEM labels for automotive, electronics and industrial applications. Woelco has revenues of $31 million, with EBITDA of $4.5 million (14.5%). The Company was acquired for $27 million, 6.0 times EBITDA, 87% of revenues. In another strategic acquisition to expand its international footprint, CCL purchased Label Art in Dublin, Ireland. In this deal, CCL paid 5.0 times EBITDA for the company which has $17 million revenues with $3 million EBITDA (a very respectable 17.6% in this segment). The $15 million price tag equated to 88% of revenues. CCL also exercised its deal discipline in a third transaction for the smaller specialty printer Mabel’s Labels, located much closer to Toronto, CCL’s home base. The acquired company produces highly personalized labels for the consumer market through its online shipping portal. While on a price-to-revenue ratio the deal seems rich at 126% of annual revenues of $9.5 million, based on Mabel’s EBITDA of $2.8 million (29.5%), the multiple paid was a modest 4.3 times EBITDA. In a sign of the times indicative of the continued evolution in the commercial printing segment, Epicomm announced that the trade association will be merging with Idealliance. Epicomm itself is the result of the merger of three trade associations (AMSP, NAPL and NAQP), having rebranded only last January. AMSP in turn was the rebranded identity of the former Mailing and Fulfillment Service Association (MFSA). Epicomm focuses on the big picture of the printing industry, conducting high-level economic research, advocating and providing management training and expertise. Idealliance, on the other hand, has been instrumental on the ground level, bringing knowledge of workflow and technical standards to the industry. The Midwest commercial printer with the unique name, Bolger Vision Beyond Print, acquired fellow Minnesotan Twin Cities printer Western Graphics. While terms of the deal were not announced, MB Business Capital reportedly provided a $11.25 senior credit facility to Bolger in conjunction with the acquisition. Action Print* was acquired by Universal Printing Services. Both companies are located in Des Moines, Iowa and the merged companies will be consolidated into Universal’s current location. Thomas Printworks, formerly Thomas Reprographics, headquartered in Richardson, Texas, acquired Seebridge Media in Houston. With over 25 locations in Texas, Arizona, Minnesota and Florida, the acquisition, as well as the new name, appears to signal a much deeper commitment to a broad base of print-related services. * Graphic Arts Advisors, publisher of The Target Report, served as exclusive advisor to Action Print in this transaction.